To prove that Alsace really is one of the greatest wine regions of France it owed it to itself to produce wines of exceptional quality, in the literal sense of the word "exceptional". Such wines could neither be produced in every vintage, nor in just any vineyard. They must have remarkable maturity and be as good as, or even better than, the finest comparable wines produced anywhere in the world, in order to be credible. It is not enough to talk about quality, it must also be put into the bottle and then into the glass in order to enter the memory of the consumer. These late-harvest wines, traditional products in the Rhine valley, had become almost completely forgotten in Alsace. Yet certain wines from 1865 to 1921 remain firmly in the collective memory of several generations, while 1934s and 1945s still exist to prove the ageing potential of these late-harvest wines made from over-ripe grapes affected by noble rot. It was certainly tempting to want to reproduce these prestigious wines. However, in order to be certain of the result, it was first necessary to define the conditions of production by means of a law within the framework of AOC (Appellation d'Origine Contrôlée) regulations. A law is always necessary, to protect the winegrowers from themselves and in order to guarantee the quality of the wines. The following outlines the careful thought that led to the drafting of this law in 1977 and, after a long and difficult struggle, to its publication on 1 st March 1984. In fact, if everyone was honest, there would be no need for any laws at all, but sometimes it is necessary to force people for their own good. - a prior declaration of intent to produce late-harvest wines, indicating exactly which vineyard is to be picked, must be made to the local INAO office. - the grapes, and the quality and natural sugar content of the juice from the press, must be physically checked. - chaptalisation (the addition of sugar to grape must) and acidification must be completely forbidden … of course. Quite a novelty ! - a certificate of conformity must be issued by sworn officials, which alone will permit the wine in bottle to be confirmed by blind tasting at least 18 months later. - a blind tasting “agrément ” of the wine in bottle,under the control of t he INAO,which is remarkably severe. 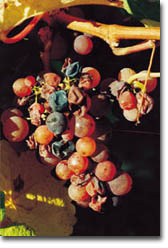 - ano late-harvest wine can be released for sale under that name until it has passed the blind tasting test. All these measures are the guarantee that there can neither be fraud nor error of vinification. Alsace winegrowers know that only what is serious will be recognised in the long term. Alsace winegrowers know how difficult it can be to vinify such wines, and so they exchange advice in order to succeed together for the common good. This determined approach to quality production is the sign of a new state of mind in Alsace. A new spirit of pride and emulation motivates our winegrowers. In addition, the cost of undertaking these checks is paid for by the winegrowers themselves ! It is amazing, we are paying to be inspected ! We are cited as an example, and even copied in other French wine regions. Taste these noble products, you will be surprised and charmed. All this legislation was initiated by my father and I. It is the first time that an INAO law has been written by a winegrower knowing exactly what can happen in the secret of the wine cellar. The "HUGEL" family is proud that its dream has come true.